The nature of visual perception is rich and ambiguous and can stimulate extraordinary sensory experiences. Sally Fawkes’s glass sculptures explore the intersections between the intangible and the physically apparent, expressing the possibilities of experience as the boundaries of the visible and invisible blur. Her research encompasses sensory response and interactions with places and spaces; physical space, and, or concepts in space. She records historical and contemporary interests through drawing, painting, photography and recently video. Transparent optical casts of glass become the core of her three-dimensional narratives which she works to highly polished surfaces, adding layers of engraving, textures and deep carving to provide a richness of language that holds the attention and begs further investigation. Her trademark application of mirrored surfaces add a further layer of complexity and animation that delight in confusing and beguiling the eye whilst also giving her the opportunity to paint on a reverse surface. The resulting surface colours and textures are rich and associative giving voice to further layers of information. Each piece has its own distinct expressive narrative that captures the imagination in a journey of intense visual exploration. The Latin word for mirror, ‘speculum’ giving us the verb to speculate. Her sculptures invite you to immerse yourself in the complex realm of what you see, what you think you see and so what is potential. Sally holds a First Class Honours degree in 3D Design-Glass from Surrey Institute of Art and Design, UK and has received several awards for research and development from both the Arts Council and Crafts Council of England. She has worked as a professional artist since 1999 and is a member of the Royal British Society of Sculptors. Having lectured at UK universities she currently lectures at The Royal Danish Academies of Fine Art and Design, Denmark at their specialist glass and ceramics department on Bornholm. Most recently Sally has completed an artists residency at MusVerre, Sars Poteries, France and will have a solo exhibition at the museum opening in October 2018. Sally has an international exhibition profile, recent exhibitions include London Art Fair, London, Art Shanghai, China, Coburg Glass Prize, Germany, and Salisbury Cathedral, UK. She also works to commission (often site specifically) for private, corporate and public spaces and has 15 years experience of creating artworks for marine vessels. Her work is represented in numerous Museum and Public collections in the UK and abroad, for example, V&A, London, National Museums of Scotland, Edinburgh, M.A.V.A., Madrid, Spain, and MUDAC, Lausanne, Switzerland. Plymouth College of Art, Tutorials-Contemporary Craft, Plymouth, UK. Institute of Sustainable Design, Swansea, Wales. Professional Practice Workshop. Crafts Council Hothouse Panel. UK. The Glass Sellers Prize, Runner Up – Collaboration with Richard Jackson. Chair - Crafts Council Hothouse Panel. UK. Curator – Ethereal Planes, Contemporary Applied Arts, London, UK. Mentoring, CGS pilot Mentoring Scheme, UK. Mentoring, Crafts Council Next Move. UK. Thomas Lyte Modern Heritage Award Judge. In association with Crafts Council, UK. Visiting Tutor, MA Contemporary Craft, Univerisity for the Creative Arts, UK. Workshop Leader - Glass Sculpture Masterclass, Centro National Del Vidrio , La Granja, Spain. Visiting Lecturer, The Royal Danish Academy, School of Design, Bornholm, Denmark. Panel member -Crafts Council Business Development Awards, Crafts Council, UK. Specialist Tutor - BA(Hons) Contemporary Craft. University for the Creative Arts, UK. Award For Artists, Arts Council of England. Training and Development Bursary, South West Arts, UK. Setting Up In Business Award, Crafts Council, UK. Award For Individuals, South East Arts, UK. Specialist Tutor- BA (Hons) Ceramics and Glass, Buckinghamshire Chilterns College, UK. Studio Assistant to Colin Reid, UK. BA (1st Class Hons) 3 D Design - Glass. Surrey Institute of Art and Design. Foundation Studies in Art and Design, Southend College of Technology, UK. ‘Two Views’ collaborative solo show with Richard Jackson. Scottish Gallery, Edinburgh. ‘Significant Ground’, Rabley Contemporary Gallery, Marlborough, UK. ‘Significant Rhythms’ The Scottish Gallery, Edinburgh, UK. CAT. Scottish Gallery, Edinburgh, UK. CAT. ‘Moments In Light’, Lancaster City Museum, Lancaster, UK. ‘Canwood Gallery International Summer Exhibition, Canwood Gallery, Herefordshire, UK. ‘Glass Glamour’, Quenington Old Rectory, Gloucestershire, UK. ‘Fresh Air Sculpture Show 2017’, Quenington, UK. ‘London Art Fair 2016, represented by Lemon Street Gallery, London. Newby Hall Sculpture Exhibition, Newby Hall & Gardens, North Yorkshire, UK. ‘Art Breda’ with Wanders Modern & Fine Art / Dock Gallery, Netherlands. ‘Living Glass II. Acquisitions 2012 to 2014. MUDAC, Museum of Design and Contemporary Applied Arts, Lausanne, Switzerland. ‘Modern Masters’ at Handwerk & Design, Munich International Fair 2015. Munich. ‘Heat and Dust’, Joanna Bird, London. Coburg Glass Prize 2014, Coburg, Germany. CAT. Art & Antiques Fair s’-Hertogenbosch 2014, with Van den Doel I Van Dun, Netherlands. Van Den Doel I Van Dun, Oisterwijk, Netherlands. ‘2Q13- Women Collectors Women Artists’, curated by Lydia Cowperwait and Marcelle Joseph, Lloyds Club, London. ‘Dan Klein & Alan J Poole Collection’. National Glass Centre, Sunderland, UK. ‘Sculpture Al Fresco III’, Great Fosters Hotel, Marcelle Joseph Projects, Egham, CAT. Surrey, UK. ‘Collect’ with Contemporary Applied Arts, Saatchi Gallery, London, UK. ART Shanghai 2013- ‘Contemporary Glass Show’, New Glass Art and Ceramic Art Pavillion, New Town Central Park, Shanghai, China. ‘Makers Auction’ Contemporary Applied Art, London, UK. ‘Biennale Brabrant’, Gallery van Loon & van den Doel, Netherlands. ‘International Art-Glass Exhibition’ – Zwiesel, Germany. European Prize for Applied Arts, Grand Hall - Anciens abattoirs, Mons, Belgium. Treasures of Glocestershire, Chorley’s, Prinknash Abbey, Gloucestershire, UK. ‘Art of Healing’, Sarum College – Salisbury Cathedral, Salisbury, UK. Rabley Contemporary Gallery, Marlborough, UK. ’50 Years of Studio Glass From Great Britain’ Europaisches Museum Fur Modernes Glas, Coburg, Germany. ‘Ethereal Planes’ Contemporary Applied Arts, UK. ‘SOFA’ New York represented by Contemporary Applied Arts. New York, USA. ‘Making Connections’, The Lightbox Museum, Woking, UK. ‘British Glass Biennale 2010’, Ruskin Glass Centre, Stourbridge, UK. ‘Polychromy-Verriales 2010’ La Galerie Internationale du Verre, Biot, France. ‘Collect’ represented by The Scottish Gallery, Saatchi Galleries, London, UK. ‘SOFA NY 2010’, with Contemporary Applies Arts, New York, UK. ‘Bees’, Contemporary Applied Arts, London, UK. ‘In the Making’, Museum in the park, Stroud, UK. ‘ART COUPLES the DNA of art’, New Brewery Arts, Cirencester, UK. ‘Precious Metal’, Quest Gallery, Bath, UK. ‘Glass and Silver’ Martins Gallery, Cheltenham, UK. ‘Newby Hall Sculpture Park 2009' Newby Hall & Gardens, North Yorkshire, UK. ‘Gallery in the Garden’ The Gallery at Bevere, Worcester, UK. ‘Fresh Air 2009’ Quenington Sculpture Trust, Quenington, Gloucestershire, UK. ‘The Glass and Wood Show’ The Gallery at Bevere, Worcester, UK. ‘Chelsea Flower Show' with The Garden Gallery, Hampshire, UK. ‘Collect” represented by The Scottish Gallery, Saatchi Galleries, London. 'Modern and Contemporary Glass' auction, Bonhams, London, UK. ‘Contrasts and Collaboration’ 2 person show with Richard Jackson, Dan Klein & Associates, London, UK. ‘Featured Sculptor - Royal Watercolour Society’, Martins Gallery, Cheltenham, UK. ‘Glass Casting” St. Joseph Galerie, Netherlands. On The Edge’ Touring exhibition originating at Cheltenham Museum and Art Gallery. 3 person show with Richard Jackson and Ronald Pennell. Leon Salet, Maastricht, NL. ‘10 Years On’ 2 person show with Richard Jackson, M.A.V.A. Museum, Madrid, Spain. Chase Charity Art Sale, Royal College of Art, London, UK. ‘In and Out, Contemporary Glass’, Brewery Arts, Cirencester, Gloucestershire, UK. ‘British Glass Biennale 08’ Ruskin Glass Centre, Stourbridge, West Midlands, UK. CAT. ’Newby Hall Sculpture Park, Newby Hall, North Yorkshire, UK. ‘The International Ceramics Fair‘ with Adrian Sassoon, London, UK. ‘Sculpture Exhibition 2008’ The Garden Gallery, Broughton, Hampshire, UK. ‘International Glass Sculpture’, St Ives Society with Plumbline, Cornwall, UK. ‘Art @ Delamore 08’, Delamore, Devon, UK. ‘Diamonds’ CAA 60th Anniversary, Contemporary Applied Arts, London, UK. ‘Collect’ with Contemporary Applied Arts, V&A Museum, London, UK. ‘Art London’ represented by Adrian Sassoon, London, UK. Scottish Gallery at Partridge Fine Art, London, UK. Chase Charity Art Sale, Royal College of Art. ‘Side by Side’, Devon Guild Of Craftsmen/CGS, Devon, UK. ‘Outside Inside’, Contemporary Applied Arts, London, UK. ‘Newby Hall Sculpture Park, Newby Hall, North Yorkshire, UK. ‘Fresh Air 2007’ Quenington Sculpture Trust, Cirencester, Glos, UK. ‘The International Ceramics Fair’, with Clare Beck at Adrian Sassoon, London, UK. ‘Non Conformists’ Morgan Contemporary Glass Gallery, PA, USA. ‘Sculpture Exhibition 2007’ The Garden Gallery, Broughton, Hampshire, UK. Dan Klein and Associates Glass Sculpture exhibition, London, UK. ‘Contemporary British Sculpture’, Martins Gallery, Cheltenham, UK. ‘Collect’ at the V&A represented by The Scottish Gallery, UK. ‘International Art & Design Fair’ Clare Back at Adrian Sassoon, New York, USA. ’Newby Hall Sculpture Park’, Newby Hall, North Yorkshire, UK. International Ceramics Fair with Adrian Sassoon, London, UK. ‘Three Ways’ Three person show, Scottish Gallery, Edinburgh, Scotland, UK. ‘Collect’, with Scottish Gallery, V& A Museum, London. UK. ‘Traversing’ touring from Ebeltoft Glass Museum. Jan-March, Shipley Art Gallery, Gateshead, UK. April-June, The Hub, Lincolnshire, UK. ‘Art London’, with Adrian Sassoon, Business Design Centre, London. ’The Discerning Eye’ Invited Artist selected by Martin Smith, Chairman of the English National Opera.The Mall Galleries, London. 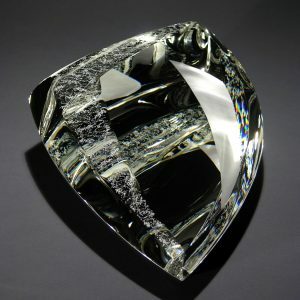 ‘Glass Focus’, Contemporary Applied Arts, London, UK. ‘Fresh Air 2005’, Quenington Sculpture Trust, Quenington, Gloucestershire, UK. ‘International Ceramic Fair, with Adrian Sassoon, London. ‘Newby Hall Sculpture Park’, Newby Hall, North Yorkshire, UK. ‘Highlands Craft Exhibition’ touring Scotland, UK. ‘Seeing Clearly’ Morgan Contemporary Glass Gallery, PA, USA. Sculpture exhibition, Thompsons Gallery, London, UK. Contemporary British Glass at Daniel Katz, London, UK. Collect, Victoria and Albert Museum, London, UK. with Scottish Gallery. Art London with Clare Beck at Adrian Sassoon, UK. ‘Lustre: Contemporary British Glass ’ Tullie House Museum, Carlisle, UK. ‘SOFA Chicago’ with Scottish Gallery. Chicago, USA. ‘British Glass’ Glass Inspiration, Bergdorf, Switzerland. ‘A Sense of Place’ Museo Municipal De Arte En Vidrio De Alcorcon, Spain. 3 person show. Leon Salet, Maastricht, Netherlands. ‘British Glass Biennale 2004’ Ruskin Glass Centre, Stourbridge, UK. ‘Newby Hall Sculpture Park’ Newby Hall & Gardens, North Yorkshire, UK. ‘International Ceramic Fair’ with Clare Beck at Adrian Sassoon, London, UK. ‘Delamore Arts Early Summer Exhibition’, Delamore, Devon, UK. Connective Realities’ 2 person show, Studio Glass Gallery, London, UK. ‘London Art Fair’, London, with Clare Beck at Adrian Sassoon, London, UK. ‘Horizons’ Rope Store Studio Gallery, Nailsworth, Glous, UK. ‘SOFA Chigago 2003, USA, represented by Contemporary Applied Arts, UK. Art Fair with Clara Scremini Gallery, Paris, France. ‘International Art and Design Fair’, New York, with Adrian Sassoon. ‘Fresh Air 2003’, Quenington Sculpture Trust, Quenington, Gloucestershire, UK. ‘International Ceramic Fair and Seminar’ with Adrian Sassoon, London, UK. Antiquaires et Beaux Arts with Clara Sremini Gallery, Paris, France. Scottish Gallery in Cork Street, London, UK. ‘Winter Collection’ Cowdy Gallery, Gloucestershire, UK. ‘SOFA’ Chicago, USA, represented by The White Gallery. ‘The International Art & Design Fair’ New York, USA, with by Adrian Sassoon. ‘New Glass’ Contemporary Applied Arts, London, UK. ‘Garden Sculpture Exhibition’ Scottish Gallery, Edinburgh, UK. ‘Salon of the 20th Century’ with Clara Scremini, Carousel de Louvre, Paris, France. ‘Grovenor House Art and Antiques Fair’ represented by Adrian Sassoon, London, UK. ‘The International Ceramics Fair ‘ with Adrian Sassoon, London, UK. ‘Glass Art 2002, Georgina Fantoni- Catalogue exhibition, produced London, UK. ‘Art 2002’, with Adrian Sassoon, London, UK. ‘Christmas Collection 2001’ Cowdy Gallery, Newent, Glos, UK. ‘Adrian Sassoon at Beadleston Gallery’, New York, USA. ‘SOFA’ Chigago, USA, with The White Gallery, UK. ‘A Celebration of Glass’ Cowdy Gallery, Newent, Glos, UK. ‘Studio Visions’ Scottish Gallery at Thomas Goode, London, UK. ‘New Faces’ Crafts Council Shop at the V&A, London, UK. ‘Stroud Valleys Open Studios Exhibition’, Bisley, Glos, UK. ‘Glass Exhibition’ Pyramid Gallery, York, UK. ‘A Sense of Place’ Scottish Gallery, Edinburgh, UK. ‘Art 2001’ represented by Adrian Sassoon Gallery, London, UK. ‘Christmas Exhibition’ Cowdy Gallery, Newent, Glos, UK. ‘8th Gathering of Glass’ Sable V Fine Art, Wimberley, Texas, USA. ‘Light Phantastic’ Plumbline, St. Ives, UK. ‘Summer Exhibition-Glass Sculpture’ Pyramid Gallery, York, UK. ‘Fifth European Glass Sculpture’ General Bank, Liege, Brussels, Belgium, then General Bank, Luxembourg. ‘CGS Members Exhibition’ Plumbline Gallery, St. Ives, UK. ‘A Gathering of Glass’ (7th Annual) Sable V Fine Art, Texas, USA. ‘Glass of 98’ Himley Hall, West Midlands, UK. ‘Elements of Surprise’ Art Connoisseur Gallery, London, UK. MUDAC, Museum of Design and Contemporary Applied Arts, Lausanne, Switzerland. Farringdon Collection Trust, Oxfordshire. 2 acquisitions. Dan Klein & Alan Poole Collection @ National Museums of Scotland, Edinburgh, UK. 3 acquisitions. Sars Poteries, Musee-atelier de Verre, Sars Poteries, France. Mastercard Worldwide, New York, USA. McGraw-Hill, Canary Wharf, London, UK. AON - Non Marine Reinsurance, London, UK. ‘Sports Women Of The Year Awards’, sponsored by The Sunday Times in association with Vitality. Cast glass sculpture for Dream Cruises. ‘Young Artists Award’, Azuriales Opera Festival, Nice, France. Collaboration with Richard Jackson. SKY ‘Sports Women Of The Year Awards’, sponsored by The Sunday Times and Sky Sports in association with Vitality. SKY ‘Sports Women Of The Year Awards’, sponsored by The Sunday Times and Sky Sports. Group of sculptures for NCL cruise ship. Collaboration with Richard Jackson. 2.3 m H exterior sculpture. Collaboration - Richard Jackson. Private residence, York,UK. Single cast sculpture for private garden H2.0 x W0.85 mt. UK. Collaboration with Richard Jackson. Cast, carved glass with stainless steel sculpture. Overall height 1.50 m. Private garden, N Yorkshire. 2.20m H sculpture for Himalayan Garden, North Yorkshire, UK. Collaboration with Richard Jackson. 7.00 mt wall hung artwork, wall panel and free standing sculpture, NCL cruise ship. Garden sculpture, Private residence, Western Australia. Collaboration with Richard Jackson. Glass/ mirror dome and finiale for private residence, Kew, London, UK. Presentation piece for Business Link International Trade Department. Collaboration with Richard Jackson. ‘Transaction 1,000,000 I & II, Awards.’ Commissioned by Shipserv Ltd.
8mt long wall hung sculpture and two 6ft tall sculptures for Norwegian Jewel cruise ship. Mirrored glass sculpture H90cm in two parts for Hotel suite, London. Sculptures for P+O Cruise Liner. Ship - Arcadia. Triptych cast glass sculpture for private residence, London, UK. Glass and stainless steel water feature, covering a span of 2.70m sq. Tetbury, Gloucestershire, UK. H 1.90m, cast mirrored glass and stainless steel sculpture, AON Non Marine Reinsurance, London, UK. Large cast, mirrored 2 part sculpture for 12ft dining room table. Collaboration with Richard Jackson. Private residence, Suffolk, UK. Trophy - Polo match, sponsored by EC Harris, London, UK. H 1.80m, cast glass garden sculpture set on steel base, Gloucestershire, UK. Verre et Creation, No 81 December 2015, France. Verre et Creation, p4 and 10. No 80 September 2015, France. 'Exhibitions - 2Q13, Women Collectors, Women Artists, Neus Glas, Winter 2013. ‘Crafts’ magazine, No239. The Great Glass Elevator by Katy Dunn P24. ‘Iced Magic’, by Vanessa Berridge, P118-121, Homes & Gardens, January 2010. Sally Fawkes and Richard Jackson: Contrasts and Collaboration, by Jennifer Hawkins Opie, Craft Arts International no. 77, p90 and 91, 2009, Published in Australia. ‘On The Edge’ by Caroline Swash, Glass Network Issue 32, June 2009. p.11. ‘Sally Fawkes’ Profile, by Sian Thatcher, Artist & Illustrators, p54-56. Contemporary British Glass 2008, Adrian Sassoon, p 14-15 & 36. ‘Glass Show Captures Many Different Styles’, by Mary Thomas, Pittsburgh Post-Gazette, 11 July 2007. ‘Contemporary British Sculpture’ p.60-61, Art of England. March 2007. ‘Contemporary British Sculpture’ by Colin Andrews,p,8-9 Sculpture News March 2007. ‘Chemin de traverse pour quatre amis verriers’ by Thomas Maria Hubert. La revue De La ceramique Et Du Verre, p50-53. No.153, Mars-Avril 2007, France. ‘The Collection of Contemporary Craft at the Shipley Art Gallery, Gateshead’ by Amanda Fielding, Collect 2006, p.20-25. Contemporary British Glass 2006, Adrian Sassoon, p 1-5 & back cover. ‘Beautiful Dreamers’, Hotels magazine, March 2006/Vol.40, .no3(A), p.44. Blown Away’ How To Spend It. Financial Times, p18. 3rd December 2005. ‘Local Artists Exhibited at Sea’, Stroud News & Journal, p.23 August 10 2005. ‘Fire glasvenner krydser spor pa glasmuseet’ p.4-5 Glasposten, Nr.1 Jan 2005, Denmark. “Clear Cut” Tribune-Review, Style section by Kurt Shaw, USA. 21st Century British Glass: Tradition and Innovation is at Daniel Katz Gallery. Crafts, No192 Jan/Feb 2005 p19. ‘England-Contemporary Glass in London, January 2005, Neus Glas, Winter (4/04), p.42-45. ‘The Future of art is clear…or coloured’ Alternative Investments, Cash, The Observor, Sunday 5 December, p.10-11. ‘Stand’, ‘This Side Up’ No. 26 Summer 2004, p.5. Review ‘Connective Realitites’ – Glass ~Network, Issue 12, p8, June 2004. ‘Contemporary British Glass’ Adrian Sassoon 2004. ‘Connective Realities’ Studio Glass - Winter 03/04 Quarterly Publication of International Glass Art. Pages 20 - 23. ‘El Vidrio Tecnicas de Trabajo de Horno’. Pages 21, 151. Coleccion arts y oficios published by Parramon ediciones, s.a. Barcelona. ‘Cutting Edge Stuff’ Stroud News and Journal. Page 21. October 22. ‘Panel: A Worldwide View of Emerging Glass Artists by Jack Wax, moderator, with Dan Klein, Yoriko Mizuta, Tina Oldknow, and Susanne Frantz. Glass Art Society Journal, 2002. Sally Fawkes-’Fresh Air 2001’ 63ConnaughtStreet, No 4, Aug-Oct 2001 p30. ‘Major milestones for two makers’. Makers News, No 20 Autumn 2001, Crafts Council. Sculpture at Fresh Air, Dominic Cotter Lunchtime Show, 29 June, BBC Radio Gloucestershire. ‘Arcadian Voyage’ Interview on artworks created for the contemporary art collection on P&O cruise ship – Arcadia, Radio Gloucestershire, 25th November 2004. ICOM, International Committee of Museums, Glass Specialists Conference, MusVerre, Sars Poteries, France. Plymouth College of Art, UK. Institute of Sustainable Design, Swansea, UK. Contemporary Glass Society, Bristol, UK. Morgan Contemporary Glass Gallery, USA. Wolverhampton University, Department of Glass, UK. North Oxfordshire College of Art and Design, Design Department, UK. Edinburgh College of Art, Department of Glass, UK. ‘British Artists: Ceramics and Glass.’ SOFA, Chicago, USA, 2001. Work can be viewed and purchased from the above galleries or contact Sally Fawkes directly.